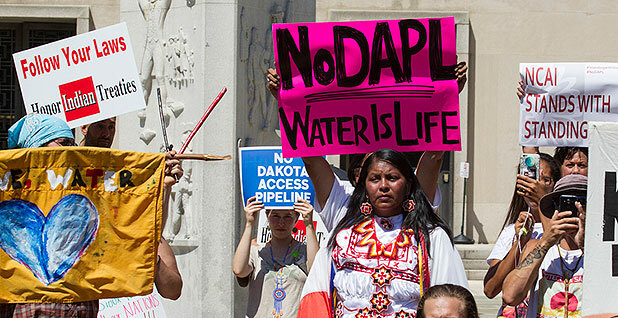 Demonstrators protest the Dakota Access pipeline outside the U.S. District Court for the District of Columbia. Photo by Greenpeace USA, courtesy of Flickr. An overlooked memo from the Interior Department's top lawyer could play a critical role in the fate of the Dakota Access pipeline, and the Trump administration is considering erasing it. Obama-era Interior Solicitor Hilary Tompkins late last year issued a formal legal opinion outlining reasons the government should conduct further study before granting final approval for the controversial oil project. The 35-page memo says the existing environmental assessment for Dakota Access suffers from fatal flaws, including inadequate consideration of tribal treaty rights and uneven treatment of the project's impacts on native and non-native populations. The Trump administration quietly suspended the opinion two weeks ago as it prepared to approve the pipeline and halt deeper environmental study. The document, known as an "M-opinion," is dated Dec. 4, 2016 — the same day the Army Corps of Engineers agreed to do more review — but it only recently surfaced in legal filings at a federal court in Washington. It includes powerful ammunition for tribes that have long pushed for additional review of the oil pipeline. "It's hugely significant," said Earthjustice lawyer Jan Hasselman, representing the Standing Rock Sioux Tribe. "It is potentially determinative of the outcome in the case." Others have cast doubt on the memo's importance. Army Corps officials dismissed it in a recent legal review, and some court watchers have characterized it as an attempt by the Obama administration to provide cover for its decision to delay pipeline approval. What's clear is that the Trump administration wants to take a second look. Interior removed the memo from the solicitor's website last week, along with three other opinions that could affect Dakota Access. Links to the documents now connect to a letter from acting Secretary Jack Haugrud noting that the opinions have been temporarily withdrawn until political appointees can decide whether they should be reinstated, modified or revoked. Former agency officials say it is not uncommon for a new solicitor to amend a predecessor's opinion. Agency records show that Tompkins, for example, scrapped or modified three opinions during her 7 ½-year tenure. But they say it's unusual to see a broad suspension of opinions — especially before the agency's political posts have been filled. Trump's pick for Interior secretary, Rep. Ryan Zinke (R-Mont. ), is awaiting Senate confirmation, and the president has not nominated a new solicitor. Hasselman slammed the Trump administration's attempt to quash the memo. "It's more of the same we've seen from this administration — taking thoughtful and considered work and tossing it in the garbage," he said. "The Standing Rock Sioux deserve better. That's why we have courts." A federal judge at the U.S. District Court for the District of Columbia will have the final say over the document's importance as he considers the tribe's latest attempt to block the pipeline. The solicitor's legal opinion emerged amid a wave of high-level review of Dakota Access approvals. The Obama administration announced last September that it would not grant the final easement needed for the pipeline to cross Lake Oahe near the Standing Rock Indian Reservation until it could double-check that its review process for prior Dakota Access authorizations was sufficient. Then-Interior Secretary Sally Jewell directed Tompkins, a political appointee serving as the agency's top lawyer, to explore tribal and environmental implications from the project. The Army Corps received a draft on Friday, Dec. 2, 2016, and the opinion was finalized that Sunday. As the Interior Department's top lawyer, the solicitor counsels the agency and issues formal legal analyses known as M-opinions. The documents, often requested by the Interior secretary on complex legal matters, include detailed research and guidance on issues the department and its various subagencies face across the country. The opinions are binding on the agency's administrative proceedings, meaning the Interior Board of Land Appeals and the Office of Hearings and Appeals follow M-opinions as final legal interpretations. The Trump administration this month suspended four M-opinions issued by Obama-era solicitor Hilary Tompkins. Links to the opinions redirect to a memo from acting Secretary Jack Haugrud announcing that they have been temporarily withdrawn to comply with President Trump's January executive actions ordering broad regulatory review and pushing speedy approval of the Dakota Access pipeline. M-37039: This Dec. 21, 2016, opinion explores the Bureau of Land Management's authority to use mitigation measures to address impacts from the agency's land-use authorizations. M-37041: This Jan. 10 opinion clarifies Interior's interpretation of an "incidental take" under the Migratory Bird Treaty Act. M-37042: This Jan. 12 opinion addresses the authority of the Fish and Wildlife Service to regulate non-federal oil and gas rights beneath national wildlife refuges. In it, Tompkins presents a trove of legal precedent defining the boundaries of the Sioux's treaty rights and potential impacts from the pipeline. Notably, she writes that portions of Lake Oahe are considered part of the Standing Rock and Cheyenne River Sioux reservations and include hunting and fishing rights that could be affected by the crossing. The tribes also retain water usage rights in the lake, the memo says. The legal opinion goes on to criticize several elements of the Army Corps' environmental assessment (EA) for the project, noting that the corps rejected a potential Bismarck, N.D.-area route due to its proximity to a central municipality and several conservation easements and other sensitive lands but did not apply the same close analysis to impacts from the Lake Oahe crossing, reasoning that the risk of an oil spill was extremely low. The EA mentions the close proximity of the Standing Rock reservation to the Lake Oahe crossing but finds "there will be no direct or indirect effects" to the tribe, its lands or treaty rights. "The EA does not explain why, if existing safeguards are inadequate to mitigate spill risk from a pipeline running ten miles from a city, they nevertheless protect federally reserved tribal waters less than one mile from an Indian reservation," the opinion says. Tompkins concludes by recommending that the Army Corps engage in a new consultation process with tribes and conduct an environmental impact statement to consider a "broader range" of alternative pipeline routes and additional oil spill risk analysis. "This should be done through an Environmental Impact Statement that will allow for robust tribal and public engagement," the memo says. The document remained mostly under the radar during the final days of the Obama administration. A former Interior communications official said he didn't recall the agency ever publicizing it, and archived webpages indicate the opinion did not appear on the solicitor's website until this year. Jewell did not cite Tompkins' opinion in her statement praising the Army Corps' December decision, and a letter from then-Army Corps chief Jo-Ellen Darcy announcing the decision alludes to several recommendations from the legal opinion but does not reference it directly. Tompkins, who is heading into private practice, said she could not comment on the legal opinion or Dakota Access while the litigation is ongoing. Former staff from her office also declined to discuss the memo. According to the Standing Rock Sioux, the Trump administration brushed aside the solicitor's opinion when it opted to reverse course on the pipeline. A Feb. 3 analysis from Army Corps officials questions whether many of Tompkins' assertions are "legally supportable" and notes that several concerns she raised were adequately addressed in the EA and safety conditions that were added to the Lake Oahe easement. Steven Stockton, the agency's former director of civil works, defended the analysis as a sufficient explanation of the agency's reliance on the original EA. "I think it does a good job of laying out the rationale for what the corps believes and believed before was appropriate and adequate," said Stockton, now at the consulting firm Dawson & Associates. But Hasselman said the agency's dismissal of the solicitor's opinion is indefensible in light of Interior's experience implementing the government's trust obligation to tribes. 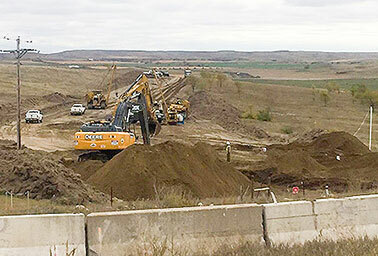 Construction crews work on Dakota Access in October. 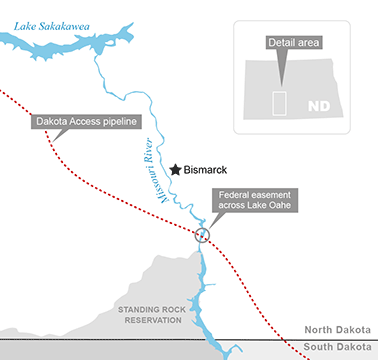 Pipeline work has now moved to the controversial Lake Oahe crossing. Photo by Ellen M. Gilmer. "The fact is that the assistant secretary made the final decision informed by this very thorough analysis and recommendation from the government officer with the greatest amount of expertise in issues relating to treaties and Indian rights," he said. "And it was the decision of the Trump administration to summarily reverse that without grappling with these important issues." The tribe is making an Administrative Procedure Act argument against the reversal, noting that Supreme Court precedent requires agencies to offer clear justification and address previous factual findings when changing a policy. "The Feb. 3 Review did not address any of the Solicitor's findings or conclusions or the well-supported analysis underlying them," the tribe said in a recent brief. "Such a conclusory statement is indefensible in light of the Solicitor's expertise and role in construing treaties and fulfilling the government's trust responsibility." The tribe's brief also notes that legal precedent requires courts to apply a higher standard of review to claims that an agency has violated its trust responsibility to tribes. The memo puts the tribes in a strong legal position, said federal Indian law expert Seth Davis, an assistant law professor at the University of California, Irvine. "This is administrative law 101: The agency must consider relevant concerns and give a reasonable response to them," he said. "The solicitor's opinion raises relevant concerns. It is a careful legal analysis that explains what the federal government would need to do to respect the tribes' rights. "There's a strong case to be made that the Army Corps shouldn't have brushed that expert analysis aside," he added, noting the solicitor's expertise in tribal issues. Both Standing Rock and Cheyenne River have referenced the solicitor's opinion in broad updated complaints submitted to the district court earlier this month, along with allegations that the Trump administration also ignored critiques of the oil spill risk assessment used in the EA. Enough to stop the pipeline? Some legal experts caution, however, that the solicitor's opinion might not make a splash in the courtroom. From an administrative law perspective, the memo could be seen as just one of many pieces of information the Army Corps considered and dealt with in its final decision — a process that could receive deference from the court. "They would need to present evidence or argument that it is a requirement for the Army Corps to integrate all of these things into their decisionmaking process so much so that deference that's generally provided to an agency that makes decisions within its expertise is overridden," said Bloomberg Intelligence analyst Brandon Barnes. Barnes said that while the memo gives the tribes more ammunition against the Trump administration's call to scrap the more in-depth environmental review, "it ultimately comes down to the agency making a decision." Former Interior Solicitor Hilary Tompkins. Photo courtesy of the Department of the Interior. "I don't know if that's going to be enough to stop oil flowing through," he said. That's where Hasselman's point about the solicitor's expertise comes in. This isn't just any agency disagreeing with another, he said, it's the agency that manages tribal issues. 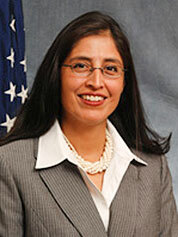 Tompkins herself is a member of the Navajo Nation and has spent much of her career specializing in Indian law. But energy law professor James Coleman, of Southern Methodist University, said the legal opinion has already been partially undermined — by the Obama administration. Much of Tompkins' memo is a blistering critique of the Army Corps' environmental assessment and finding of no significant impact for the pipeline, noting that tribal treaty rights are entitled to more consideration than "a dismissive note that a project is situated off-reservation, argument that a private corporation complied with environmental laws, or citation to general pipeline safety technology." She concludes that the Army Corps would be justified in denying the easement and suspending or revoking earlier project permits. The Obama administration's December move does neither. A Dec. 4 decision memo from Darcy, the political appointee who headed the Army Corps, announced that the agency would not grant the easement until doing an environmental impact statement. But the document goes to great lengths to defend the process the agency had followed so far. Darcy notes that "this decision does not alter the Army's position that the Corps' prior reviews and actions have comported with legal requirements." "The problem is that the Department of Interior letter says that the original environmental assessment was incorrect, and the Army secretary letter says, 'No, actually, we still think that was correct,'" Coleman said. "The tribes would be in a much stronger position if the Army Corps had said, 'OK, we need to withdraw this because it turns out we were wrong about the no significant impact finding." Barry University law professor Nadia Ahmad, who heads the American Bar Association's environmental justice committee, argued that a more fundamental problem exists in the fact that the tribes even have to raise the solicitor's opinion. "Why do they have to turn to a memorandum that was eleventh-hour during the Obama administration, and why is the treaty not enough?" she asked. "Why are federal statutes not enough to protect them?" Still, Coleman said, the legal memo could prove useful in persuading the court that the Army Corps' review process did not comply with the National Environmental Policy Act. "The odds are always tough arguing against the government, but if you were looking for things that would be helpful, a policy reversal and an interagency fight would be great," he said. "And we've got both here." The court will consider the Standing Rock Sioux's arguments about the memo next month after Dakota Access and the Army Corps have a chance to respond. A hearing for a separate Cheyenne River Sioux attempt to freeze construction is set for next Tuesday.